Blyth began on the attack as Dan Maguire powered a shot towards the bottom corner saved by keeper Drench. The hosts swiftly responded with Jake Beesley registering two opportunities on goal for Bradford before Maguire was again denied comfortably by Drench. Only the inside of the left post stood in the way of Dale from marking his landmark afternoon with a goal. But less than 10 minutes later, a beautifully weighed delivery from Michael Liddle was met freely by the incoming Reid, powering his header home. 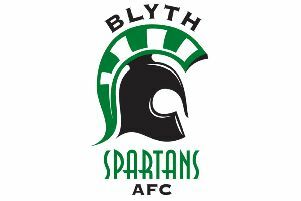 And Blyth had their goalkeeper to thank as they carried a slender 1-0 into half-time as Jameson somehow tipped behind Johnson’s effort that looked destined for the bottom right corner. For half an hour in the second period, the Spartans backline had barely been tested – but a Bradford equaliser in the 77th minute sparked the game back into life. Proceedings took another turn – 12 minutes after replacing Holmes, Rivers was shown red for a challenge on Beesley.